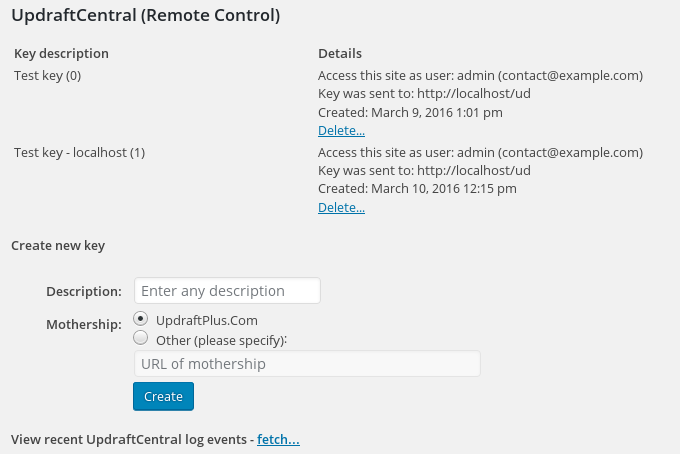 How can I see the event log for managed (child) sites for UpdraftCentral? Log in to your WordPress dashboard on the managed site. Go to the UpdraftPlus settings page, and to the “Advanced Tools” tab (the easiest way to do this is using the drop-down menu on your admin bar, after logging in). Within the “Advanced Tools”, scroll down to the “UpdraftCentral (Remote Control)” section. At the bottom of the UpdraftCentral section is the words “View recent UpdraftCentral log events” (or similar), and a link next to it. In the screenshot below, it is at the bottom, with the word “Fetch…”. Click on it! This should then show you your recent log events, most recent first. It shows you the time of the log event, the IP address of the site that sent the command (which should be your mothership site’s (i.e. dashboard webserver’s) IP address), the key that was used (these correlate with the list of keys further up the page), and then the log data.